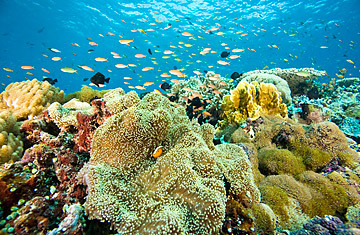 Tropical Fish and coral reef off the shores of Malaysia. In 2002, environment ministers from around the world gathered in The Hague for a major summit on the Convention on Biological Diversity  an international treaty designed to protect the world's plants, forests and wildlife. With rainforests being clear-cut in tropical countries, endangered species nearing extinction around the world, and the seas steadily being fished out, the ministers agreed it was time to take action. In a declaration, they vowed to "strengthen our efforts to put in place measures to halt biodiversity loss, which is taking place at an alarming rate...by the year 2010." Fast forward to 2010, the international year of biodiversity  things aren't getting better. In fact, for wildlife around the world, they're getting much, much worse. In a study published Thursday in Science, a team of scientists and environmentalists from around the world assessed the state of global biodiversity and found that it has been in steady decline. Gauged by the number of endangered species on the International Union for Conservation of Nature's Red List or the waning condition of coral reefs or human's increasing consumption of the planet's ecological assets, the state of the Earth is worsening. "Our analysis suggests that biodiversity has continued to decline over the past four decades, with most state indicators showing negative trends," the Science authors write. In other words, the promises of 2002 have gone unfulfilled. Yet things are still getting worse  habitats are still being destroyed, and a growing, richer population is taking space and resources away from wildlife. The effect goes beyond endangered animals; human beings rely on a healthy, diverse planet too, and when the Earth suffers, so do we. The Science study found that the populations of vertebrate species used for economic purposes by people had declined 15% since 1970, as has the population of birds and amphibians used for food and medicine. More than 100 million poor people now live in remote areas with threatened ecosystems, and will be particularly vulnerable to the further degradation of a disturbed planet. "We're trying to send the message that in protecting habitats, we're protecting the well-being of humankind," says Foster. "We all benefit from biodiversity and we all hurt when it's lost." As human population continues to grow  and global warming takes its own toll  the rest of the planet is likely to suffer. We're living on a crowded, hotter Earth, and unless we take strong, collective actions, someday soon we may not even be able to recognize our own planet. We've already lost our chance to meet the promise of 2010  and we don't have much time left to turn things around.